I have followed the Kirby franchise since I was but a wee lass. Since about the age of five years old, Kirby has been in my life. I remember playing through Kirby’s Dreamland with my older sibling and being mesmerized by the environments, enemies and of course the little pink guy himself, Kirby. I always have been a fan of platformers, and Kirby’s particular style of gameplay has always resonated with me. In my experience, it has been a bit of a slower pace, but much more relaxing than other platformers, even at the hardest bosses. 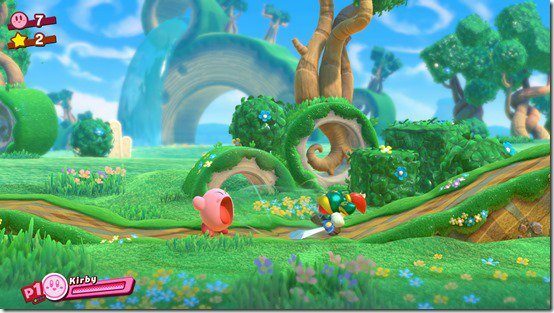 Even though Kirby has gone through many interesting experiments over the years with style and difficulty, they have for the most part been at least pleasant to play and look at. 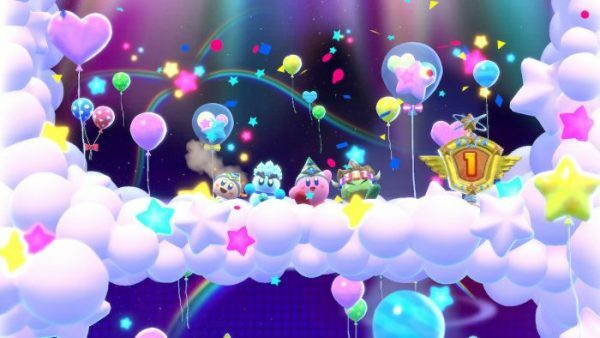 Does the new entry, Kirby Star Allies fall among the best of the franchise? Or is it just another average platforming starring everyone’s favorite pink puff ball? 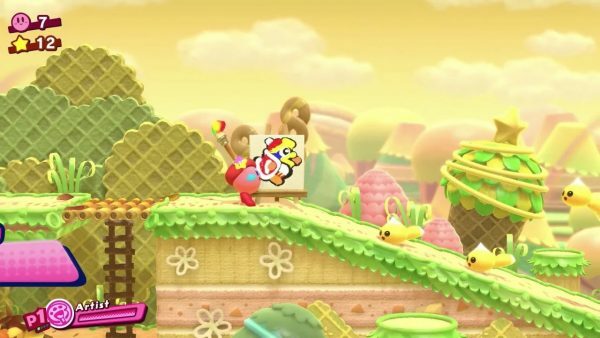 For the most part, Kirby Star Allies is much like classic Kirby entries such as Kirby’s Adventure or Kirby’s Dreamland. You go through various levels and platform your way to the end. You inhale enemies to either use them as projectiles or absorb their powers for fun new abilities. At the end of each level is the classic bonus jump game, which to this day, I am still bad at. The plot revolves around and evil entity from a distant world that has possessed the likes of Meta Knight, Dedede and many other characters. Kirby was also hit, but instead of being possessed he has gained the ability to befriend his enemies and gain help to find and defeat the evil that is engulfing the universe. One notable difference is the fact that yes, this can be a local co op experience. You can recruit either enemy AI or your real life friends to help you in your fight to save the world, and even other worlds, from evil. You can have various forms of help like those who can assist you with fire, ice, water, rock or even sweeping! Each has their use and sometimes you need them to access specific parts of the level with a particular power. It won’t be hard to tell which ability you will need to use, but sometimes you will just be the bad luck of not having the right power at the right time. Another difference is the combined ability feature. You can have yourself and your allies combine to work together to make a bridge for a mischievous key carrying waddle dee to open new doors for you, a friend circle to plow through enemies, a friend star to fly through levels and shoot enemies mid air and more! These are fun to initiate and fun to make use of when prompted. But what you really want to hear about is the abilities, after all, that is what Kirby is most known for. 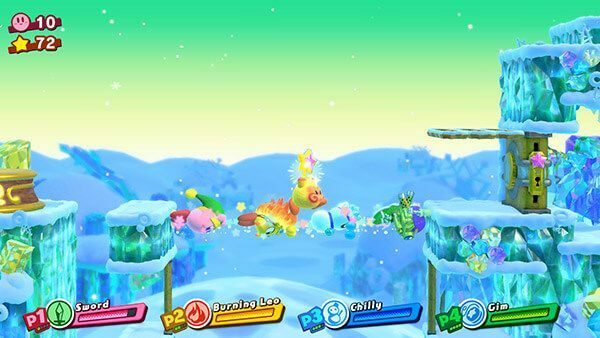 I am happy to say, there are quite a few new abilities to be found in Star Allies. My personal favorite is the artist copy ability, which allows you to splatter paint at enemies and also paint masterpieces that give you health boosts which helps if you’re fighting a boss. You also have new abilities like spider to trap enemies and festival which destroys enemies on the screen. There are more, but I won’t give them away as part of the fun is discovering them for yourself. Among new abilities are also new mini games that you can play with friends.One is a tree cutting contest using the joy con motion controls, the other is a home run contest hitting meteors with your charged bat while avoiding things such as spiders and bugs. 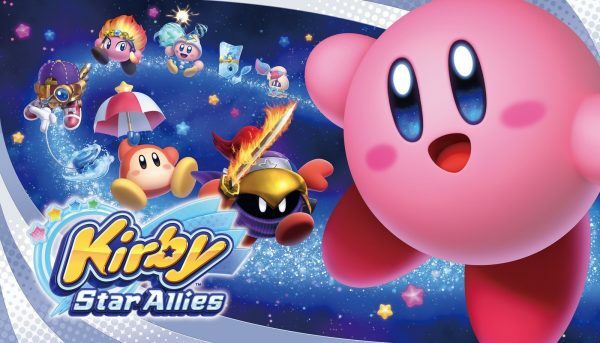 Overall, this is another strong entry for Kirby and if you have been a fan of the platforming part of the franchise, you will love this game’s charm and game play as well. 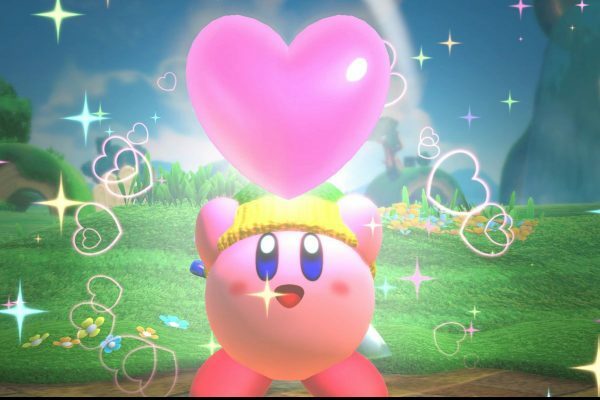 I recommend purchasing this game and experiencing the joy of Kirby by yourself or with a good friend and sharing the love.